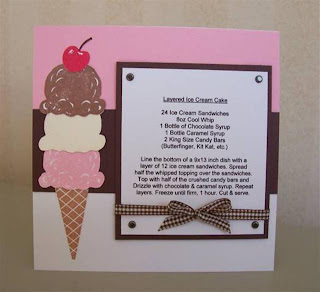 Since I've been on an ice cream kick lately, I thought I would share another recipe page that I made long ago. By the way, ice cream is one of my favorites snacks, can ya tell?! My family loves this ice cream cake and it's always such a hit when I make it to share with my friends too, but this recipe makes a lot. To create my page I layered my cardstock to sort of resemble neapolitan ice cream. Then I simply stamped my images and then cut them out. My recipe was computer generated and just in case you can't read it I have posted it below. Line the bottom of a 9" x 13" dish with one layer of 12 ice cream sandwiches. Spread half of the whipped topping over the sandwiches and then top that with half of the crushed candy bars and then drizzle with the chocolate and caramel syrup. Repeat these layers again. Freeze until firm, about 1 hour (but I freeze mine over night). Cut & serve. Cute recipe page and thanks for sharing this yummy recipe with us!